WASHINGTON, D.C. -- Despite revelations this year that the National Security Agency has been monitoring Americans' activities online, U.S. Internet users are not as concerned about the government's having access to suspects' home computers or email accounts as they were in 2000 -- during an earlier Internet age. 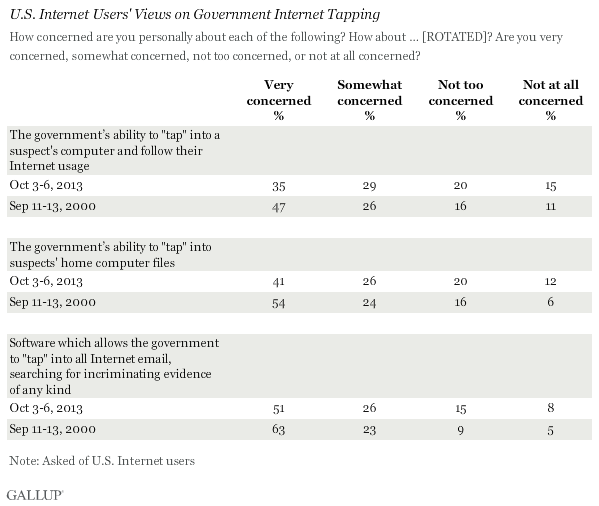 When asked three separate questions relating to the government's ability to "tap" into a home computer and to monitor email, Internet users express varying degrees of concern. In all cases, however, they are less likely to say they are "very concerned" than when Gallup first asked these questions in 2000. Thirty-five percent of Internet users are very concerned about the government's ability to tap into a suspect's computer and follow their Internet activities, down 12 percentage points from 2000. The 41% who say they are very concerned about the government's ability to tap into suspects' home computer files is down 13 points from 2000. U.S. Internet users are most concerned about the government using software to tap into email to search for incriminating evidence of any kind. About half, 51%, are very concerned about this, yet that is down as well, from 63% in 2000. These new findings come in the post-9/11 environment, in which the Department of Homeland Security commonly takes measures to monitor suspected terrorists. Additionally, they follow the Edward Snowden imbroglio, involving revelations of top-secret government surveillance practices by the former NSA contractor. Snowden's disclosure of PRISM, a secret NSA program to tap into the servers of nine major American Internet companies, became a cause celebre for privacy advocates in 2013. Although Americans disapproved of the government's collecting information in this way, only 35% said they were "very concerned" about their privacy rights being potentially violated as part of such a program. While it is not clear how Americans might have answered these questions prior to the Snowden affair, it's possible they would have shown even less concern about government Internet tapping immediately before Snowden's revelations than they do now. U.S. Internet users may be more resigned to the idea that in an advanced technological age, monitoring is inevitable, making this prospect less worrying than it once was. In the Internet's earlier days, a relatively new medium may have caused more concern about privacy than it would today, when 87% of Americans report using the World Wide Web on a computer, tablet, smartphone, or other device. Yet in the wake of 9/11, Americans may be more accustomed to the idea of government monitoring of Internet activities, and expect that it happens. Americans may also be less concerned because they support the government's pursuit of foreign or domestic targets suspected of terrorism. Results for this Gallup poll are based on telephone interviews conducted Oct. 3-6, 2013, on the Gallup Daily tracking survey, with a random sample of 887 Internet users, aged 18 and older, living in all 50 U.S. states and the District of Columbia. For results based on the total sample of Internet users, one can say with 95% confidence that the margin of sampling error is ±4 percentage points. Twenty-five percent of U.S. parents worry "frequently" about their school-aged children being harmed while at school, making it one of their biggest crime concerns. Worry is up from 2009-2011 but similar to other years.